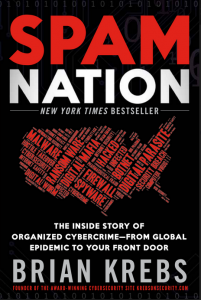 Spam Nation by Brian Krebs reads like a crime thriller. For cyber security enthusiasts Krebs is no stranger. He has been writing about cyber security and crime on his blog KrebsOnSecurity for more than seven years now and before that at WaPo. I have been reading his blog for more than half a decade now and has been huge fan of his coverage on SPAM, DoS, *wares 1. One of the biggest series on KrebsOnSecurity was coverage of pharma wars. It covers the story online pharmacies selling unauthorized medicines without prescription to Americans2 using SPAM. This series forms the base of this book. The book covers all aspects of the illegal online pharmacies – SPAM Bot systems, Malware, Payment systems, Drug manufacturers and reluctance of big pharma companies, How individuals and researchers are the biggest saviors etc. You feel like an insider. Now every time you see that Viagra advertisement spam in your inbox, you can visualize how the whole system works. While most of the book is dedicated to pharma wars, the book also tracks the first biggest SPAM success pumping and dumping microcap stocks schemes to the rise of online pharmacy to current of ransomware/cryptoware. It captures an era in the spam world like a history book but reads like a novel. All in all its a must read for anyone who is interested in cyber security.